Any group. Any occasion. Any where. Here are some of the questions we are asked most frequently. As every MadeToMeasure® treasure hunt is by definition unique and designed around your needs, the answers are intended as a general guide only. When we work closely with you to agree a specification for your event, we revisit these questions, and more, so you get the event you want. Click any numbered bar below to reveal more details. 1. What exactly is a MadeToMeasure® Treasure Hunt? An X Marks The Spot treasure hunt is a clever, tailor-made, problem-solving challenge for teams. The treasure hunt can take place anywhere, although tourist cities in the UK or Europe are particularly popular venues. Clues are provided as you might expect, but that is probably the only similarity with other treasure hunts you may have experienced. The nature of the clues requires teams to make decisions as to how they will tackle the problem, and there are a few other twists and requirements that make the experience unique, valuable and memorable for participants. But why spoil things by listing them here! 2. Who can go on a MadeToMeasure® Treasure Hunt? Any corporate or private group that requires a customised experience. Private events range from birthday parties and anniversary celebrations to social get-togethers, school reunions and charity fundraising events or any situtation where there is a group of people. The typical businesses that use our services value and invest in their own people, understand the worth of good relationships with customers and suppliers or need to motivate and manage teams. 3. Whereabouts do Treasure Hunts take place? We can even start and/or end the event in your hotel, conference centre, meeting venue, home, place of work, restaurant or bar. Paris, Berlin, Dublin, Vienna, Amsterdam and Rome are favourite European locations, while London, Oxford, Bath and Edinburgh are among popular treasure hunt venues in the UK - although we have run events in hotel grounds, parks and the countryside right across the UK and Europe. If your custom-made treasure hunt takes place in one of the 40 locations where X Marks The Spot provide ready-made self-run treasure hunts, it will help keep your costs down. 4. How many people can go on a Treasure Hunt? There is no limit on group size, and we have catered for groups ranging from two people to several hundred. Somewhere in the range of 8-40 people is typical, split into teams with 4-5 members per team normally, although this is not hard and fast. 5. How are the teams decided? Normally you decide, as you know your group best. You may wish to use existing teams, mix up existing teams, put specific people together, put people of similar types together, put people of conflicting types together or do it at random. As part of the event, we would be happy to consider conducting a behavioural analysis of individuals using MBTI® or Belbin® for example to help with team selection if you so wish or just draw names out of a hat. 6. How long does a Treasure Hunt typically last? It's up to you, but we find that around 3 hours is about right for the hunt itself depending on the venue and any other plans you may have. Add on the time for any team building theory or selection, briefing, feedback on behaviour observed, answer sheet marking, prize giving and incorporate a spot of lunch, and it's best to allow 5-6 hours. Remember to also allow time for travel to and from the location. Note that this is just a guide of what's typical - we have experience in running 1 hour and full-day treasure hunts too. 7. How do we get around during a Treasure Hunt? Public transport is used mainly in cities or tourist locations, where rail, bus or underground networks tend to be frequent and cover main places of interest. Participants tell us that in a less familiar location they feel safer using public transport than driving, and it avoids parking problems. A reasonable amount of walking is also necessary - how much of this there is often depends on how the teams tackle the problem. Resourceful teams will keep walking to a minimum! Some clues may require a particular type of transport to be used! Treasure hunts in more remote locations may require the use of cars, bicycles or even boats. Themed treasure hunts using black taxis, vintage double decker buses or inflatable high speed RIB boats are also possible in certain locations. 8. What will I see? Obviously, this depends on the location and how well (or badly!) you do the treasure hunt - but we aim to ensure that each treasure hunt gives participants a taste of familiar (and some less familiar!) sights at any given location. There are often a host of monuments, back alleys, churches, famous former residences, markets, palaces, green spaces and quirky parts of each city just waiting for you to discover. 9. Do we need a map or a guide book? X Marks The Spot provide all the materials needed for your treasure hunt, including maps and guide books. However, you may wish to purchase a guide book for personal use, particularly if you are extending your stay. 10. What do the treasure hunt packs contain? Typically, and dependent on the location and format of the hunt, a team's waterproof treasure hunt pack will contain the clues, local maps, a guide book, travelcards and pencils. There may also be some 'extra items' which we won't reveal. What the pack contains at the end may differ! 11. What skills do participants need to take part? An elementary map-reading ability and an open mind. You may emerge with other skills you never knew you had! 12. What level of physical fitness will I need to take part? Differing levels of physical fitness amongst participants is acknowledged and so the treasure hunt is designed to ensure that every participant can play a full part. A fairly large part of most hunts is spent on foot - teams who think smart and walk do better than those that run aimlessly. For your own safety, X Marks The Spot require that participants must declare all known medical conditions before the hunt commences, and usually at time of booking. In no circumstances will X Marks The Spot be held liable for the injury or illness of any participant during or as a result of the hunt. Please consult a medical practitioner if you are in any doubt. 13. Are the clues difficult? Difficulty is a relative thing! Many years of experience has given our clue-setters a good instinct as to what works and what doesn't. For example we wouldn't provide a set of clues where every single clue was based solely on observation - as we feel that insults your intelligence, offers little variety and doesn't really encourage you to be resourceful in finding out the answer. The style, content and difficulty of clues varies depending on the event but typically you might expect cryptic, anagrams, code breakers, general knowledge, photos, topical stuff, tasks to complete, items to scavenge, lateral thinking and a mix of word and number puzzles. Plus the odd trick question (you have been warned!). Consequently, the variety of our clue styles gives our treasure hunts wide appeal to people of varying interests, ages and abilities. 14. What if we get stuck on a clue? This is unlikely, as we tend to avoid 'traditional' treasure hunt formats which force you to go from point A to point B and so on. Consequently, you can avoid getting stuck by simply skipping the clue. Chances are you'll eventually work it out - and don't forget there are usually lots of local people to ask, so you shouldn't be short of help. 15. Is there a prize? Prizes (for winners, wooden spoon, most resourceful team etc) can be provided as part of the treasure hunt, and will incur an additional cost. Alternatively, we are happy for you to organise your own prizes and in our experience this tends to work best as you know what works best for your group. We often find that companies prefer to give their own corporate goodies or fun prizes or combine the prize giving as part of a wider award ceremony recognising staff achievements. 16. Can the treasure hunt be incorporated into our other plans? Yes, this is actively encouraged, and is where a custom-made treasure hunt comes into its own. A treasure hunt can be devised to share a theme with something else you are planning, such as a conference, product launch or reunion. And of course the treasure hunt can be scheduled to fit around other activities, such as a meeting, site visit, exhibition, corporate hospitality, training, award ceremony, get-together or dinner. Sometimes, having to work out the dinner venue from the clues adds a little extra incentive! Our Treasure Hunts tend to cover popular and touristed areas. However X Marks The Spot cannot accept liability for your safety on a Treasure Hunt - the responsibility is yours alone. Make sure that you have travel insurance and we advise that you take normal sensible safety precautions when travelling, including carrying only the bare minimum where possible. X Marks The Spot has public liability insurance cover of £1 million. But for your own safety, it is a condition of booking that clients undertake to arrange and provide adequate insurance cover for their participants, including travel and liability insurance cover for example. Good corporate insurance policies should be perfectly adequate without amendment. Please consult your insurance company if you are in any doubt. 18. What about travel and accommodation? Transport to and from the treasure hunt location, transfers and accommodation at the location can be arranged on your behalf if you so wish and will form part of our overall quotation. X Marks The Spot uses fully licensed and bonded travel agents and operators to make these arrangements. 19. What about meals and refreshments? Meals and refreshments are not provided as part of the treasure hunt. These can be arranged on your behalf if you so wish and will form part of our overall quotation. 20. I'm the organiser, what do I need to do? We take care of most things. For corporate events we usually look to you to co-ordinate work colleagues so they know where to be and when. As the treasure hunt materials are branded, we may ask you for a company logo or event name. You may also wish to determine who is in each team as you will know participants best. The extent of your involvement also depends on the degree to which individual clues are tailored and the extent to which the treasure hunt must fit with your other plans. For private events, most of your time will be spent giving us the low-down on who's taking part and providing us with information to help us tailor the treasure hunt. This can usually be achieved via a telephone conversation and email. 21. Can you outline how you will work with me? We pride ourselves on our experience, professionalism, attention to detail and customer focus. Execution by delivering your event in the way specified. Why? The purpose of the treasure hunt, e.g. celebration, personal development, incentive. Who? The participants, how many, their profile, how they will be formed in teams; any requirements you have for observers or further facilitators. When? The likely date for the event and its duration. Where? The location and venue, the transport, accommodation, meal and prize requirements. What? The approach, e.g. serious, fun, relaxed, competitive, collaborative; the budget; any special needs you may have. How? The fit of the treasure hunt with other activities; the structure of the treasure hunt and clues. We then produce a quote for the agreed level of service and make any further adjustments you require. If acceptable, you complete a booking form based on the revised quote. Research begins on acceptance of the booking form by X Marks The Spot. This includes desk research into the chosen location and the development of clues in draft form. Any further details of the company or individual that are relevant to the treasure hunt are gathered at this time, plus any desired accommodation arrangements. X Marks The Spot make a reconnaissance visit to the location to gather further information, check clues, answers, timing and viability. Hotels and restaurants are also visited at this stage if necessary and local transport and hire arrangements are confirmed. A typical site visit can easily last up to 3 full days. On return, production of the treasure hunt materials is completed and support staff arrangements for the treasure hunt are finalised. An event timetable is prepared and prizes acquired if necessary. We keep you informed of progress throughout the process and may occasionally need to contact you for input by phone or email. 22. Can we run the Treasure Hunt ourselves? Yes. If you want to do this, we design the format of the treasure hunt with this in mind, and we provide the support materials you need to fully manage the event on the day. Where we run your event, our clients usually benefit from a treasure hunt with additional twists and turns that would be too challenging for a client to run themselves without experience or training. 23. What does a Treasure Hunt cost? Each treasure hunt is unique, designed around your needs and priced on an individual basis. Location, group size, duration, degree of fit with other events, content, complexity, travel during the hunt, travel to and from the location, accommodation and meal arrangements and prize requirements are amongst the variables that are considered. We will discuss your specific requirements then prepare a quote accordingly. Given the complexity of some events and to ensure only genuine enquiries are handled, it is our policy to charge for any face to face consultation at a customer's request prior to quote production. This is then refunded in full against the subsequent booking. 24. What's included in the price? We agree this with you as part of the specification which is drawn up when the quote is accepted. The basic cost of every treasure hunt usually includes desk research; a reconnaissance visit to the location by X Marks The Spot; planning, production and distribution of all materials for the treasure hunt; full facilitation of the event (if required) including briefing, monitoring, marking, adjudication and facilitator disbursements; instructions on how to run the event (if self-run); transport during the event for all participants (for a facilitated event); and collection and collation of feedback from participants. Meeting room and equipment hire, mobile phone rental, camera rental, prizes, travel to and from the location, accommodation, meals and the services of a behavioural observer(s) and their disbursements are optional extras which will be detailed on the quote but which are outside the basic cost. Insurance and outdoor clothing are not provided. 25. What if I have to cancel? Our Terms and Conditions include our cancellation policy. Our Standard Rates and Charges for Cancellation are on a sliding scale, starting at 20% of the event fee. Full Terms & Conditions are issued at time of booking. 26. Can you send me more information? This web site is designed to provide you with answers to most of the general queries you may have about us and our treasure hunts, and it is updated regularly. In recognition of our clients' increasing ability and preference to communicate and trade electronically, we do not produce a separate hard copy brochure, but prefer instead to pass these cost savings on to you. We are always happy to discuss any specific queries you may have. 27. How far in advance should I buy a Treasure Hunt? As each treasure hunt is custom-made, we would appreciate as much advance notice as possible to get your input and then prepare the highest quality treasure hunt we can for you. Notice in weeks rather than days is preferred :-). If we are facilitating your treasure hunt this also enables us to check our staff availability and other commitments for your preferred date. 28. Why should my group go on one of your Treasure Hunts? A Treasure Hunt from X Marks The Spot™ gets you and your group out and about, talking, thinking, working together in teams, sharing, learning, exploring and having fun. The net result for a business is that increased effectiveness, involvement, motivation and knowledge sharing are brought back to the workplace. This provides a good basis for discussion of problems, formulation of new ideas and quicker implementation of improved work methods - giving your staff more responsibility and making your business more adaptable and flexible. The net result for private groups is an event that is remembered and talked about long after it finishes. Read about benefits in detail. 29. I'm interested in booking a Treasure Hunt. What do I do now? Give X Marks The Spot a call to discuss your group's specific aims, requirements and interests. Call 07801 693001 from within the UK or +44 7801 693001 if dialling from outside. Alternatively, complete this simple form and we'll be in touch. If there's anything else you need to know, please contact us. 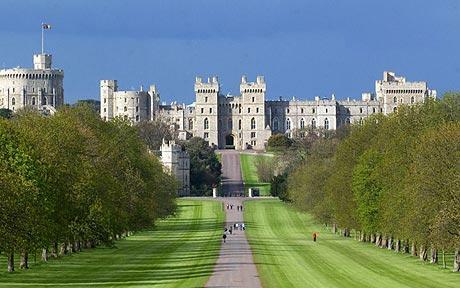 10 good reasons to consider the Berkshire town of Windsor for a social occasion or business event.